Posted on December 10, 2018 by J.T. If you’re like most Americans, you love your cell phone. Many of us are rarely more than a few dozen feet away from our smartphones, and as a population, we buy cell phones at an astonishing rate. In fact, every minute nearly 395 iPhones are sold. 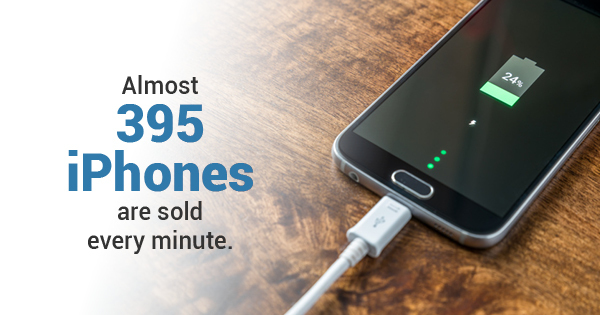 That’s more than six iPhones sold per second! As much as we love our phones, cell phone accessories make them even better. A cool case or charging cable personalizes a smartphone and makes it more functional for meeting our daily needs. Nothing is more frustrating than sitting next to an outlet on the floor because your charging cable doesn’t reach the nearest seat. Make sure your charger reaches your bed, the sofa, or the booth at a restaurant with an extra-long cable. Standard cables are about three feet long, but you can find chargers six, 10, or even 12 feet long to reach across entire rooms! These days, driving with a dead cell phone is a bit frightening. What if you get lost and need to navigate? What if an accident happens and you need to call for help? Never drive without a phone again by purchasing a car charger. USB adapters can fit into cigarette lighting ports, so even older cars without USB ports can still charge your device. If you have a phone and an HDMI-compatible T.V., you can stream any internet video service to the bigger screen using an HDMI-micro USB conversion cable. Skip the squinting and watch your favorite shows and movies on the T.V. screen like a real adult. Are you someone who is always on the move? Whether you’re traveling, on a run, or simply out of the house, a portable charging bank can ensure your phone battery lasts all day long. Just charge the portable battery at home, then plug into your phone while you’re out and about for a phone battery boost. These smart cell phone cables and accessories can keep your phone charged in nearly any circumstance. As the holidays approach, cell phone accessories also make great gifts. For more great cables to connect to all your favorite devices, visit cablewholesale.com today!